The overnight sleeper bus from Goa to Pune was fun. Since Pune is located on the Deccan Plateau, we passed by some beautiful sceneries and the higher altitude gave us much relief from the warmer parts of India. Reaching the bus stand, it was the first time we have exeperienced cold in India at approximately 18 degrees celcius. We booked a hotel near our alighting point in Pune for convenience sake since it was our the first day in a place we are not familiar with. However, we felt something amiss when there was no railway station nearby as indicated on our map. After 15 minutes, we found out that we were one hour away from Pune. We misinterpreted the driver saying this was the last stop in Pune rather than this was the last stop BEFORE we head for Pune. Sleepy, hungry and in need of a toilet urgently, we were left with no choice but to hire an auto-rickshaw driver. We were happy we found one who would drive us using metered fare rather than proposing an inflated price. During the journey, the drivers were warm and friendly although i was quite suspicious why the auto-rickshaw had two drivers instead of one. What made it even fishier was that the assistant driver was casually placing his arm strategically to block out the fare price. Feeling the cooling breeze on my face made me calm and appreciate everything that is happening so i was not really bothered with over-analyzing. About 45 minutes through the journey in the middle of the highway, the driver stopped on the side and told us to pay some money first. The fare showed IDR 100. Then he took out a rickshaw conversion table and explained that in Pune, the meter needs to be multiplied according to the table. I thought it was fair since a 45 minute ride would cost about IDR 400. After doing some calculations using illogical formulas, the fare turned out to be IDR 3900, equivalent to SGD 90!!! That was just plain ridiculous!!! We paid a total of IDR 1500 for a comfortable 12-hour bus ride and these guys are charging us IDR 3900 for a 45-minute rickshaw ride? It dawned on me that i was being conned for the first time in my life. I begged them to be reasonable but they countered with lame excuses knowing that we will eventually abide by their rules since we were trapped in the middle of a highway with our bulky luggages. In the end i unwillingly negotiated for IDR 3000 and they sent me near Pune’s border and got me another driver for IDR 100 to drive us to our hotel. Reaching the hotel, we were given another lame excuse that the cheap room we booked online was unavailable. Too demoralized to argue, we gave in and paid extra for an upgraded room. After settling in, resting for a few hours and digesting all the unlucky streaks we were having, we set out to explore Pune. What we did not know at that point of time however, was that we stayed at Old Pune, which is the only part in Pune which is heavily congested, with nothing much to do or see. After walking around for an hour or two, we were lost and took an auto-rickshaw back. Since he said it was a metered fare with no multiples, we hired him. After reaching our destination, the meter read IDR 50. I gave him IDR 100 since I had no change. He happily kept it in his pocket and prepared to drive off. I signalled to him about my change and he politely explained that we had to pay double for his return trip back to his base where he picked us up. Enraged, both of us yelled at him, created a ruckus and threatened to call the embassy. Frightened, he threw the IDR 100 back at me and shouted some vulgarities in Marati and told me to get change at the hotel counter. After settling the fare, we went up to our room with an all-time low in our hearts since we left Singapore. We both had enough of Pune, forgot all about our happy times in the other parts of India and made up our minds to just take the next flight out to Nepal. Unfortunately, Linda caught the flu bug despite having an immunisation jab which was supposed to last a year. The next 3 days were utter boredom and misery, imprisoned in our hotel rooms just watching TV (all praises to mankind for creating HBO and Star Movies!) We were on movie marathons for 3 days while Linda was recovering. On the last day, Linda felt better and we met a friend we knew online through Couchsurfing. When we first met Rishi, he asked why we stayed in this part of Pune. Then he brought us around the other parts of Pune. Both of us were too dumbfounded to react when we learnt how the other parts of Pune was actually VERY pleasing to live in especially near the Osho Ashram at Koregaon Park. Anyways, when we got back, we started researching online for plane tickets and things to do in Nepal. Accidentally stumbling upon Paragliding in Kamshet, a 2-hour ride from Pune, our luck finally gave us a break and decided to turn around on what would be one of the best 2-weeks of our lives! 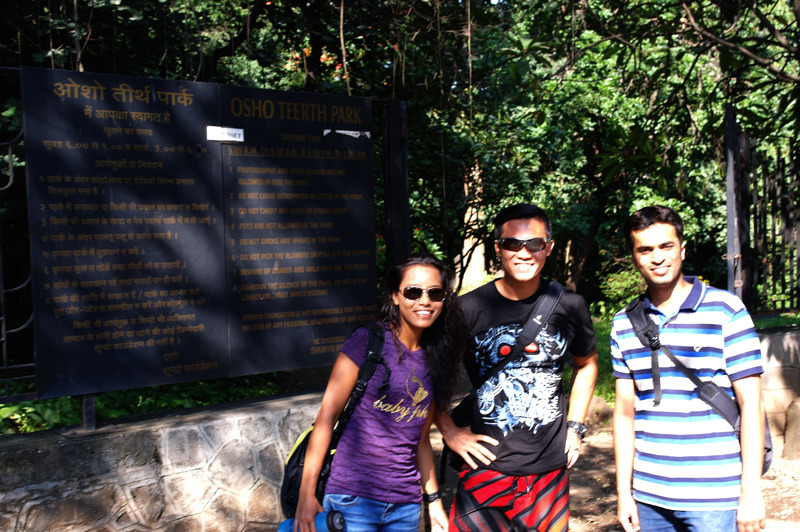 The only picture worth taking in Pune – with our Couchsurfing saviour, Rishy.